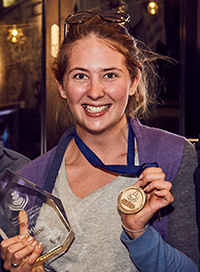 Sam Taylor won first place in the inaugural Danes International Grand Latte Art Championship, held at Café Pyd in Waterloo, New South Wales on 7 August 2015. 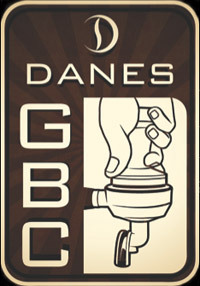 Congratulations to all the winners of the Danes Grand barista Championships (GBC) and Grand Latte Art Competition (GLAC) on Tuesday 28th August 2012 at the Specialty Food & Drink Fair Darling Harbour. Kim Yeong from Hong Kong was the winner of GLAC and $2,000 provided by Riverina Fresh with an amazing presentation of latte art creations against some just as amazing competition presentations. Paul Asquith was the winner of the Australian GBC on Monday and also backed up on Tuesday to take out the Australasian final and $5,000 provided by Danes in a performance that kept getting better the more he presented it. The coffee and the competitor standard throughout the championships was outstanding and a joy to watch and to host. Thank you again to all the industry judges who gave up their time, our wonderful sponsorswho were of great support and to the entire Danes team that worked perfectly together to host a truly inspiring event. The 2008 Grand Barista Championship was held on Saturday 21st June, 2008 at the Manly Yacht Club. 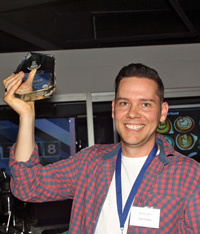 Congratulations to Habib Maarbani who took out first place and is the 2008 Grand Barista. The second and third places went to Jessie Hyde and David Seng respectively. Mark Bell and Angus Mackie who also scored very well. Thank you to all those who competed. Danes Gourmet Coffee Institute 2004 Grand Barista Champion is Dom Majdandzic with 2nd place Scott Callaghan and 3rd David Maken. It was standing room only as the baristas tamped and textured their way through the judging criteria. On hand to assess their performances were some of Australia's finest judging talent including last year's World Barista Champion - Paul Bassett and the current National Champion Maico Lapenna. 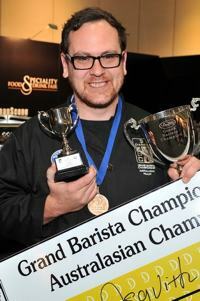 Congratulations to Alex Klum who is the Grand Barista Champion 2003, seen here in action in another exciting, close fought grand final. 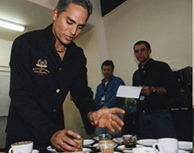 After 3 days of heats, 6 finalists including Maico Lapenna, the 2001 title holder, battled it out for the 2002 Grand Barista Championship. The winner was Jai Gabbard from Manly. The grand finals for the grand final barista competition proved to be an exciting battle to the final moment. The competition was fierce and the standard of performance excellent! Finding a winner amongst the talent on show was a difficult task indeed however the TGCI would like to congratulate Maico LaPenna who is this year's Grand Barista.